Shirts are a must-have for any men’s wardrobe, but during AW18, they are even more of an essential thanks to their long sleeves, comfortable material and ability to be dressed up or down. Perfect for any occasion that may arise, men’s shirts are ideal for the upcoming party season where our social calendars seem to fill up quickly. If you’re looking for a shirt for a particular occasion, or you simply want to update your wardrobe ready for the season ahead, here is a style guide to some of the most popular men’s shirt designs out there right now. A style that never seems to go out of fashion, check shirts are a timeless design that are perfect for this time of year. Check shirts are ideal for formal wear or to create a more casual look; whatever the occasion requires. Creating a lumberjack-inspired look, almost any colour works great in a check print; from grey, navy, red, mustard yellow or dark green. 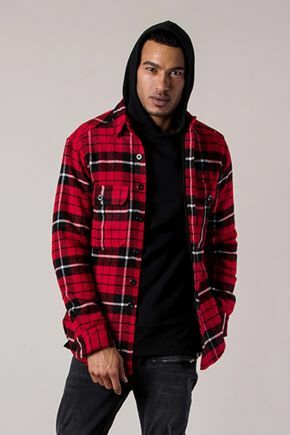 Check shirts can be worn buttoned up and tucked into your favourite pair of black jeans, with smart shoes to match; or, dress it down by wearing it open over a printed t-shirt with blue jeans and trainers. The smartest shirts are usually the simplest of designs; plain and in a block colour. Choose white, black or other sophisticated shades like dark green, burgundy or plum. These are best for evening occasions or when something more formal is required; but the choice is yours as to whether you style your smart shirt with jeans or suit trousers. Smart shirts should be fitted, but not too tight, with minimal branding detail. For a streetwear edge to your smart look, choose a shirt with a curved hem for a relaxed appearance when untucked. Have a bit of fun with your AW18 wardrobe and incorporate patterns and prints into your everyday style. Patterned shirts are a perfect way of adding some light-hearted style to a smart design, and when done properly it can look very stylish indeed. Look for muted colours like grey, plum or even black and white for a statement choice. This can ensure no pattern looks too garish. When it comes to choosing the type of pattern, recent trends have included checks and stripes, but look for unique designs too; roses interspersed with skulls, tropical floral prints and others that stand out amongst the typical, go-to patterns. Keep it long sleeved and wear with fitted jeans and smart shoes for a great evening look that allows your personality to shine through. The ultimate casual style when it comes to men’s shirts; the overshirt. Designed to be layered, the overshirt is ideal for an off-duty, weekend look. Look for military style overshirts in shades of khaki and taupe for an authentic look, with distressed detail and branded logos. Structured with chest pockets, military overshirts are great to wear with a simple t-shirt and jeans, with a puffer or parka jacket over the top for the ultimate casual outfit.